Bright colors, fun costumes and music videos, guitar solos, and a laid back fun party atmosphere. Sound familiar? Well, there are two possibilities. One is the myriad hair metal bands that dominated downtown L.A. for much of the 1980s, and the second is Reel Big Fish, another group of California boys with a fun sound, albeit that sound owes a little more to punk, ska, and reggae than the Sunset Strip. Formed in the early 1990s in Huntington Beach, CA, Reel Big Fish are one of the most recognizable names in Third Wave Ska. Combining big guitar/horn riffs with upbeat rhythms sure to incite a dance floor riot, the band had a slew of hits in the 1990s, most notably “Sell Out,” appeared in the film Baseketball (starring South Park creators Matt Stone and Trey Parker), and toured from one side of the globe to the other. Since being released from their contract with Jive Records in 2006, Reel Big Fish has been steadily rolling on their own steam, releasing a studio album, a live album, and now a cover album entitled Fame, Fortune And Fornication. The album features 11 tracks, ranging from ska legends Toots And The Maytals to The Eagles to Poison (actually, the band covers two Poison tracks on the album). 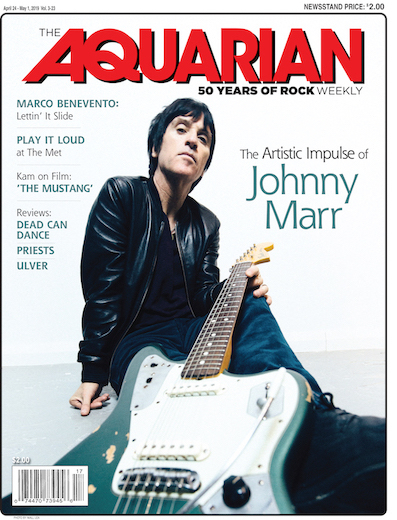 Lead vocalist, guitarist, and songwriter Aaron Barrett and trumpeter/vocalist Scott Klopfenstein were kind enough to take time out of their touring schedule to talk with The Aquarian about Fame, Fortune And Fornication and life outside of the umbrella of a major record label. Let’s get the obvious question out of the way first. How did Fame, Fortune And Fornication come about? Aaron: Just because we haven’t done an official covers album. It was kind of the next thing on the list of things we wanted to do. Since we got off a major label we can pretty much do whatever we want to whenever we want to. We came up with a bunch of songs, but ended up with those. Aaron: It was totally random, like ‘Oh! we should do that song. I like this song.’ Like one day on the bus we were watching a Tom Petty documentary [“Won’t Back Down” is featured on the album]. Or a song randomly pops on your iPod like ‘Oh my goodness!’ Just totally random. The Poison songs are on there because it was my idea to make a Poison tribute album, but no one else wanted to do that. No one else was excited about it. Aaron: That is too bad. Although many of us wouldn’t see it at first, ska and hair metal have a similar fun, laid back vibe. Aaron: One thing I liked about hair metal is that it’s really fun. It’s why I started playing guitar. I wanted to play rippin’ guitar solos. One of my other first favorite bands was UB40 so that kind of got me into reggae and pushed me towards ska. Scott: Aaron’s always been a huge Poison fan. Poison’s always been a very large part of Reel Big Fish from the get go. Melodic riffs, solos and stuff like that. Poison—it’s there. Great interview. I <3 the Fish :).